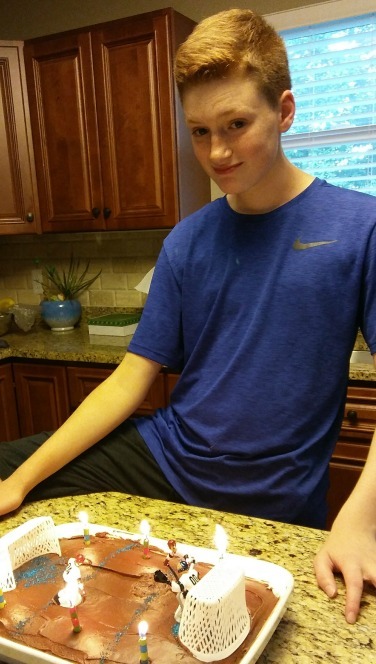 My son turned 14. I might be biased, but I think he’s becoming such a handsome young man. He played in a summer hockey league with his high school team. I was worried about my incoming Freshman playing against Juniors and Seniors, but he held his own! We ate hot dogs at the drive-in and walked to the ice cream shop. The kids and I took our cat for walks on her leash. She loves it. We played outside a lot, random games of Frisbee or something my kids call 500 ball. Sometimes we had fun. Sometimes someone ended up crying or whining because they didn’t win. 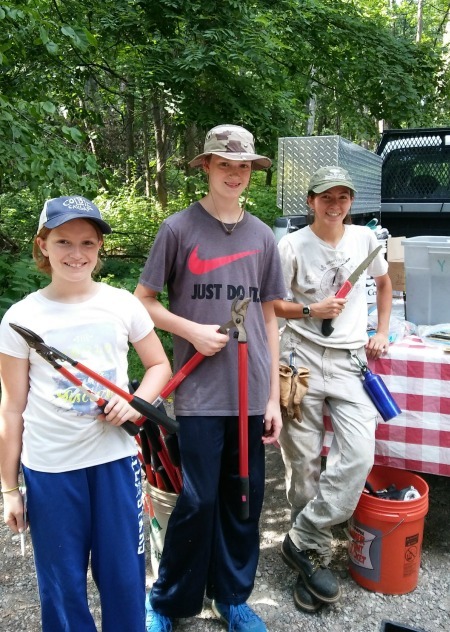 We volunteered with a local conservation group and cut down invasive species like buckthorn and honeysuckle trees. My daughter cared for a hurt robin before it died, my husband buried it in eh woods, and she cried about it for a week. We blew things up on the 4th of July with the neighbors. ‘Merica! It was fun how the kids arranged all their snacks and sleeping bags for the big show. We rode our bikes. The kids also rip-sticked, but I refused to try those Boards of Death! 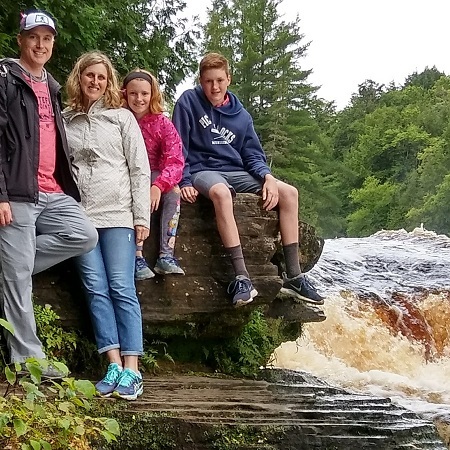 We took a vacation to Michigan’s Upper Peninsula where we saw the sights, kayaked, slept, ate, fished, and enjoyed getting away from it all. 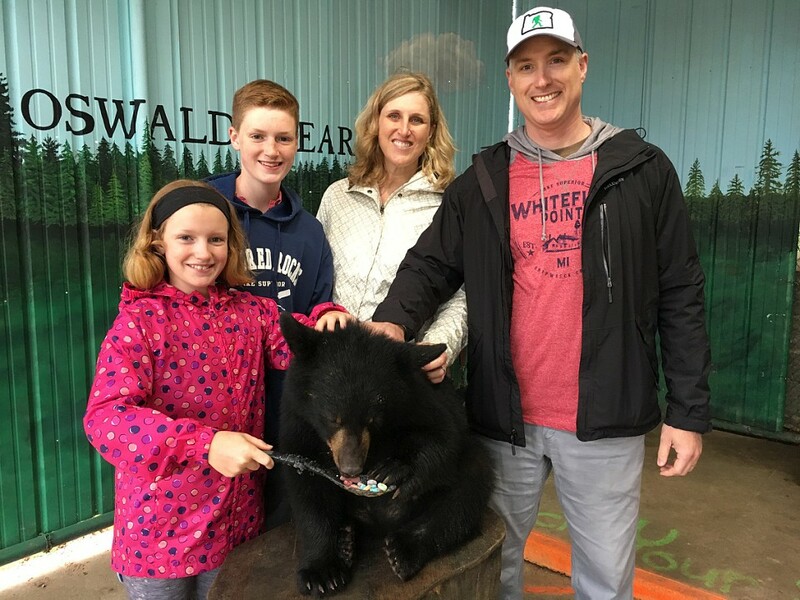 Oh, yes, and we also met a black bear! Here we are feeding it peanut butter and Fruit Loops. Who knew they liked that?! We soaked up every moment we could of summer. It’s short, but glorious here in Michigan. Alas, now the countdown begins to the first snow. Can you tell this southern California girl still gets the willies about a Midwest winter?! What were some of your favorite summer highlights? I’d love to hear about them in the comments. Aw it sounds like you had a WONDERFUL summer filled with all the right things… Good for YOU. BUT we also went to the pool to swim. Ha! Just for fun though- so there’s that. We were busy, too, with high school hockey stuff. It was both a blessing and a curse. I think you know what I mean girl!! Looks like you guys had a great summer filled with fun activities! 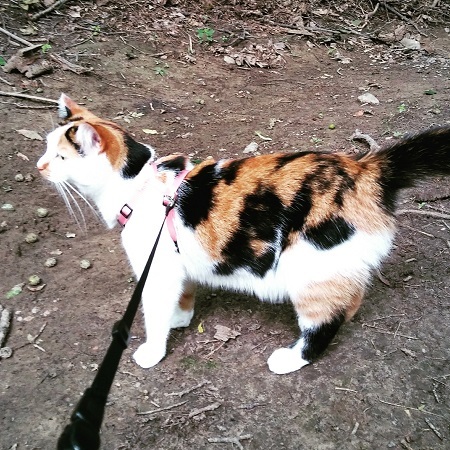 And can I just say – I love a cat on a leash! They look so cute and happy to roam around. So, what’ s the deal with the bear? I”m thinking it can’t be real but …. It is real indeed. They make you pay $10 cash to have a picture with it. I guess they know so much about bears that they know a cub can’t rip your face off. Yet. At least that’s what I told myself before taking my family into a cage with just a spoonful of peanut butter and sugary cereal to save us. What a fabulous summer! They go so fast don’t they? 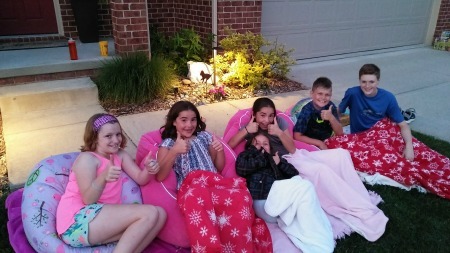 I love the sleeping bags outside…we had a few films outside on a giant screen and it was so much fun. Your holiday in Michigan looks fun; that river looks like a torrent though…We enjoyed a week on a greek island and a weekend in Seville. A Greek island and Seville? Sounds exotic and lovely to this American! We go back to school on Tuesday after the Labor Day holiday. Sniff! The bear cub and the ranch it lived on were really cool. In the middle of nowhere, too! Sounds like quite the summer. I’m having a hard time envisioning a cat on a leash, though.